In the real world, bad habits tend to be pretty fun. People can’t resist ‘em, even though they generally know these habits will eventually bite. But in the harsh world of Google Places, most people don’t even know what the bad habits are. That’s because the bad habit in Google isn’t glamorous or fun: it’s plain old-fashioned neglect. It’s neglecting to keep the good habits. 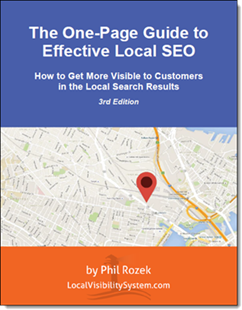 The result of neglect is your local visibility suffers—and so does your business. Not only can you maintain your visibility in Google Places by following the “good habits,” but to the extent you’re not as visible as you’d like to be, these habits also can help grow your local visibility over time. 1. Check your Places page. Just make sure everything looks OK and that all the info on there is accurate (and if it’s not, login to your Google Places “Dashboard” and make any changes as need-be). Now, anyone can make edits to your Places page—even if it’s owner-verified. Scary. 2. Check up on your Google Places rankings for the search terms you want to be found for. Preferably take screenshots and file them away. It’s smart to keep track of whether/how your rankings change over time. 3. Look at all the photos on your Places page. All sorts of photos can wind up on your Places page—whether by fluke or by people’s intentionally uploading them to your page. Just keep an eye on what’s in the “Photos” area of your page. 4. Read your reviews. Make sure there aren’t any fishy ones, and make sure there isn’t a negative or fake review at the very top of the list of reviews on your Places page. If you see fishy reviews, flag and/or report them to Google. If there’s a legitimate but negative review that just sticks out like a sore thumb, you should do two things: (1) write a polite response to the review, and (2) step on the gas and ask more of your happy customers for Google reviews, so as to put the negative one(s) in perspective for anyone who’s looking at your Places page for the first time. 5. 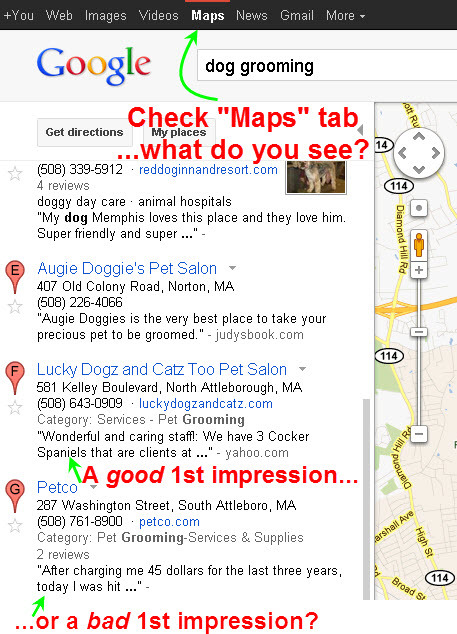 Look at all your competitors’ Google Places pages. If there are any customer reviews that truly seem phony—as though your competitors wrote themselves some glowing reviews or paid someone else to do so—flag and/or report them to Google. More importantly, just keep an eye out for good ideas: aspects of their Places pages or websites that you like and that you might want to use for your own business. Always look for good pages to take out of your competitors’ playbooks—especially if they outrank you. 6. Read the “Google Alerts” emails that you receive regularly. Whoops…I forgot to mention that before you can do this, you need to go to http://google.com/alerts and set up some Alerts. With Alerts, you’re telling Google to notify you every time specific information is published on the Web. For example, if your company is Acme Dynamite Co., you can tell Google to notify you every time anyone writes about “Acme Dynamite Co.” anywhere on the web. Then you can create a separate alert for “Wile E. Coyote,” another for “Roadrunner,” and for whatever other terms you want to monitor. I suggest you set up Google Alerts for your business name, your given name, your website name, AND for the names of your local competitors, their website names, etc. You’ll probably end up with 2-3 dozen Alerts—but you’ll be able to keep tabs of exactly what’s being said online about you and your competitors. While you’re at it, you ought to check Twitter regularly for what (if anything) is being said about you and/or your competitors there. 7. Do a GetListed.org scan. Make sure you always score “100%”—and if you don’t, get yourself listed on the third-party sites it tells you you’re not listed on. 8. Check your listings on the major data providers: Acxiom, InfoUSA, and LocalEze. More specifically, you’re checking two things: (1) you’re checking to see that your business is listed on all these sites (if it’s not, add it), and (2) you’re seeing whether all the info they have on your business is 100% accurate (if it’s not, correct it). All this may sound daunting, but it’s quick and easy: The absolute worst case is you’re not listed at all and have to spend 20 minutes submitting your business this one time. Or, if your business info isn’t accurate, it will take maybe 5-10 minutes to submit the corrections. Of course, it’s just as likely that everything is A-OK and that you’ve only taken 2-3 minutes to check up on how you’re listed on these crucial sites. 11. This wasn’t on the original list, but it’s an excellent checkup item that Mike Blumenthal himself has suggested (see comments): type your business name into Google and see what pops up on the 1st page of Google results. Take a minute to eyeball everything on the first page: do the photos for your business look weird or strangely cropped? Is the map pin in the right location? Is there a scathing review or inaccurate description from a third-party listing that’s visible in the organic results? This is crucial, because when potential customers search for you by name, there’s a good chance they’ll become real customers. They’re yours to lose. Just make sure that nothing on Page One looks bad; it’s where you can and should shine. What does your Google Places maintenance routine look like? Any items you’d add to either of these lists? Great list – very actionable and worth passing along. I wasn’t aware of acxiom, do you know who they feed data to? Hey Phil – This is a great list! I sent it around to our team. Not sure if you use Raven Tools, but they archive screenshots of the search results and track rankings. This won’t take care of checking in on the Maps results, but definitely helps automate regular checks. What I’m really on the prowl for is a tool that not only tracks GP rankings, but that also tracks local-search terms that do NOT include geo-modifiers (like “bakery,” rather than “bakery Philadelphia”). But, just the same, thanks for the rank-tracker recommendation! Oh man, if you find that tool, let me know! We have several clients this would be extremely helpful for. Great list! I’ve bookmarked it for future reference. (Right now we’re having trouble just getting our locksmith clients’ Google Places consistently up and visible…sigh.) I have learned from personal experience that I can’t just rely on the dashboard to show how well a listing is doing. We had one listing that looked like it was showing from the back end but was getting the dreaded ‘Google does not support this location’ message from the front. Question: if I use UBL, does that affect how I submit to/check on Acxiom and the other aggregates? You’re absolutely right to check the GP listing both in the Dashboard and in the SERPs. I’ve had the same experiences that it sounds like you’ve had, which is why I urge people to go with “belt and suspenders” and check both front-end and back-end. My understanding of and experience with UBL so far has been that it’s just another data-aggregator (albeit a paid one) to pile onto the others. They have a page somewhere on the site where they talk about exactly which sites they feed, but I believe they feed Acxiom and the other aggregators. In my eyes, UBL is a nice-to-have; the crucial thing is to submit to the “Big 3,” as you know. This is excellent information. I went into GetListed.org last night and either modified or created listings with all of the search companies. It appears that many of the existing listings are using my address in US post office format which is 10609 W. 52nd Ter and other listings are using 10609 W. 52 Terrace. When I try to change some of the listings from W. 52 Terrace to W. 52nd Ter the listing address changes but when I recheck the GetListed.org Local Business Data Accuracy Report I don’t see the change. Can someone tell me why? Hey Bill, thanks for the compliments. What you’re encountering is just the fact that it takes a while for GetListed to get the most up-to-date info from those third-party sites. Even if all your info is correct on those sites–which it sounds like it is–it typically takes at least a few weeks for GetListed to reflect that. I’ve yet to run any business through Get Listed’s ranking system and get a 100% rating. The best I’ve gotten is around 86%… I’m a little suspect of a system that rates a business at 56% when I see only Express Update is showing as ‘claimed’…And Yext seems to be worse. They’ll tell you your listings haven’t been claimed when I know that they have… Does anyone know of a listings rating site that’s a little more reliable and accurate? The scoring breakdown on GetListed is sometimes less than obvious. For instance, I think you can get “points” if you’re listed on a site but you haven’t claimed your listing. I think you also get extra/fewer points depending on how complete your Google listing is – whether it has photos and the like. I’m sure you’ve checked out the “accuracy” tab, but if you haven’t, that may show some areas where you can improve your score. But sometimes you do just get an “X” for no apparent reason. So all that really matters is whether you know for a fact you’re listed on all those sites and correctly. I think DIYSEO has a similar tool, but I don’t recall how different the scoring is.